Mr. George joined the firm in 2016 as an associate. 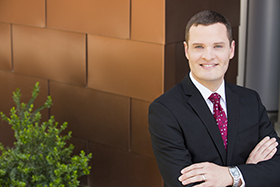 Mr. George’s practice focuses on land use and environmental law, handling all phases of the land use entitlement and permitting processes, including administrative approvals and litigation. His practice includes the California Environmental Quality Act (CEQA), the National Environmental Policy Act (NEPA), the State Planning and Zoning Law, and the federal Endangered Species Act. During law school, Mr. George served as a Board Member for the Journal of International Law and Policy, and as a Board Member for the Environmental Council of Sacramento. Prior to joining Remy Moose Manley, LLP, Mr. George worked as an associate at David Allen & Associates, and clerked for the California Environmental Protection Agency, Air Resources Board, the Office of the Attorney General, Public Rights Division, and the Placer County District Attorney’s Office, Public Integrity Unit. Mr. George was elected as Treasurer of the Environmental Law Section of the Sacramento County Bar Association for 2018.